I’m impressed by Mozilla’s commitment to designing in the open—one of the hardest parts of any kind of brand work is getting agreement, and this process must make that even more difficult. I have to say, I quite like both options on display here. Some lovely branding work for the UK Parliament, presented very nicely. 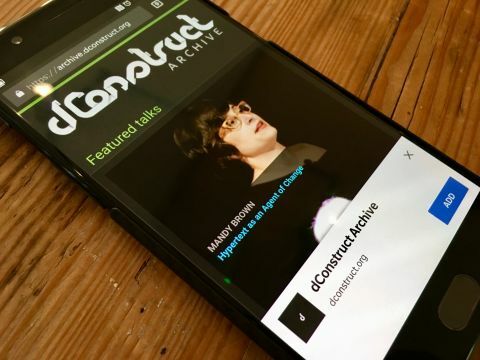 When I was testing the dConstruct Audio Archive—which is now a Progressive Web App—I noticed some interesting changes in how Chrome on Android offers the “add to home screen” prompt. Additionally, the prompt appeared immediately on the first visit to the site. I thought there was supposed to be an added “engagement” metric in order for the prompt to appear; that the user needs to visit the site more than once. The user types the URL archive.dconstruct.org into the address bar. The home-screen prompt slides up from the bottom of the screen. The user immediately moves to dismiss the prompt (cue me interjecting “Don’t close that!”). We web designers and web developers have trained users to dismiss overlays and pop-ups if they actually want to get to the content. Nobody’s going to bother to actually read the prompt if there’s a 99% chance it’s going to say “Sign up to our newsletter!” or “Take our survey!”. Because the prompt now appears on the first visit, no trust has been established between the user and the site. If the prompt only appeared on later visits (or later navigations during the first visit) perhaps it would stand a greater chance of survival. 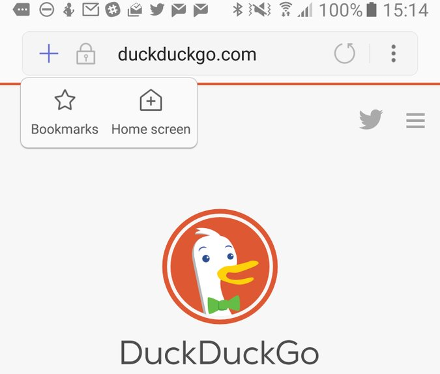 It’s still possible to add a Progressive Web App to the home screen, but the option to do that is hidden behind the mysterious three-dots-vertically-stacked icon (I propose we call this the shish kebab icon to distinguish it from the equally impenetrable hamburger icon). 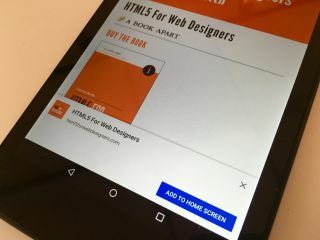 I was chatting with Andreas from Mozilla at the View Source conference last week, and he was filling me in on how Firefox on Android does the add-to-homescreen flow. Instead of a one-time prompt, they’ve added a persistent icon above the “line of death” (the icon is a combination of a house and a plus symbol). 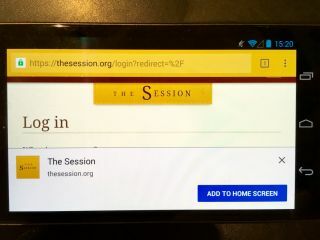 When a Firefox 58 user arrives on a website that is served over HTTPS and has a valid manifest, a subtle badge will appear in the address bar: when tapped, an “Add to Home screen” confirmation dialog will slide in, through which the web app can be added to the Android home screen. This kind of badging also has issues (without the explicit text “add to home screen”, the user doesn’t know what the icon does), but I think a more persistently visible option like this works better than the a one-time prompt. Firefox is following the lead of the badging approach pioneered by the Samsung Internet browser. It provides a plus symbol that, when pressed, reveals the options to add to home screen or simply bookmark. 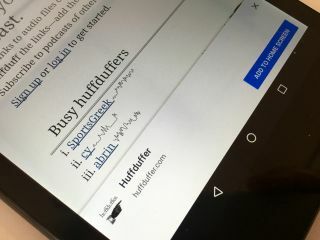 I don’t think Chrome for Android has any plans for this kind of badging, but they are working on letting the site authors provide their own prompts. I’m not sure this is such a good idea, given our history of abusing pop-ups and overlays. Sadly, I feel that any solution that relies on an unrequested overlay is doomed. That’s on us. 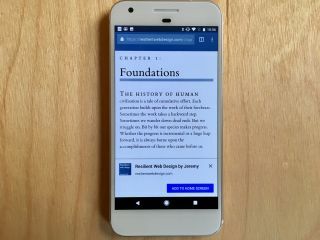 The way we’ve turned browsing the web—especially on mobile—into a frustrating chore of dismissing unwanted overlays is a classic tragedy of the commons. We blew it. Users don’t trust unrequested overlays, and I can’t blame them. For what it’s worth, my opinion is that ambient badging is a better user experience than one-time prompts. That opinion is informed by a meagre amount of testing though. I’d love to hear from anyone who’s been doing more detailed usability testing of both approaches. I assume that Google, Mozilla, and Samsung are doing this kind of testing, and it would be really great to see the data from that (hint, hint). But it might well be that ambient badging is just too subtle to even be noticed by the user. On one end of the scale you’ve got the intrusiveness of an add-to-home-screen prompt, but on the other end of the scale you’ve got the discoverability problem of a subtle badge icon. I wonder if there might be a compromise solution—maybe a badge icon that pulses or glows on the first or second visit? Of course that would also need to be thoroughly tested. A look at our relationship with waiting, and how that is manifested in the loading icons in our interfaces. For me, in my moments of boredom, as I turn to my phone and refresh my social media feed, I imagine that what’s on the other side of the buffering icon might be the content that will rid me of boredom and produce a satisfying social connection. The buffering icon here represents my hopes for the many ways that my social media feeds can satisfy my longings at any given moment. They rarely do, though I believe that we are half in love with the buffering icon here because it represents the promise of intimacy or excitement across the distances that separate us. A useful tool to help you generate a manifest file, icons, and a service worker for your progressive web appsite. A good reminder from Roger on how to hide images from an SVG sprite from assistive technology (use aria-hidden) and how to expose them (use title elements within the sprite). The currentColor value in CSS comes in very handy when you’ve got an SVG sprite and you want icons to inherit their colour from the surrounding text. An up-to-date round-up of the various techniques available when you want to provide a fallback for SVG.